Education has changed its meaning day by day. In ancient times it centred round the gurus or the teachers but today it centres round the students. To keep in mind the needs of the children we, on behalf of VSSU, trying our level best to provide them with such things that will help them not only to build their mental strength, logical power of thinking, but also make them good human beings. If a teacher helps the students as a friend, philosopher and guide, it is my firm belief that any student can flourish like shining gems in every sphere of life. 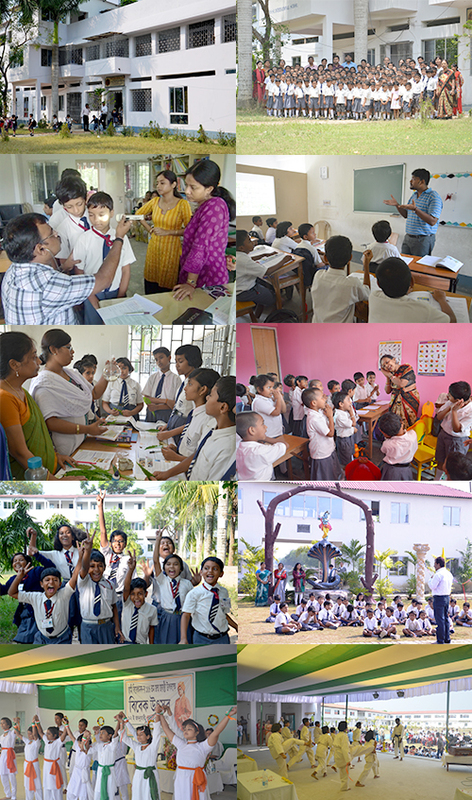 The VSSU International School bearing the mother concern name VSSU (Vivekananda Seva Kendra-O-Sishu Uddyan) is an educational project of the parent NGO. In 2012, the organization celebrated its jubilee year of twenty-five years completion. It was soon after that, the desire of establishing an English medium-Co-educational school that would cater the children of the village, right from their infancy to high school level, germinated, and a handful of interested parents inspired the idea –which ultimately saw its daylight on the 8th of February 2013. Computer facilities and full classes. We have also provided school buses for our school students. We have also provided with Extra Tutorial Classes (Home Work) for our students. We also have our Wall-Magazines and Extra Curricular activities. We also provide news papers, articles to our students for reading. Spoken English classes for all. Dance, song, Yoga, Karate classes. Laboratory facilities for science students. Audio-visual classes for all students. Indoor and outdoor gaming zone. For proper understanding and betterment of the students we have arranged Open House in every Friday of every month and PTM (Parent Teacher Meeting) in every first Saturday of every quarter. At present we have our residential unit of 30 students supported by a group of teachers. We are in a process to increase the capacity of the boarding along with the residential teachers. The students get the chance to visit International Brotherhood Conference Ground (IBC), a unit of VSSU. It is an amusement park where students get to spend a gala time. VSSU Tourism Centre has several things for the students as well as for other visitors. It serves as an Educational tour campus , children amusement zone, water sports sector. One of the most mentionable department of its is the Great men Gallery viz. LIGHT HOUSE. Where it has all the details of great personalities and their works.